I’m always delighted to get feedback from readers. Please use the “comments” feature to leave feedback on specific posts. I always read your comments and will reply if applicable. If you wish to contact me directly, please e-mail me at june@myfoododyssey.com. Unless otherwise stated, all content on this website (photographs, graphics, posts, recipes, etc.) are my own work and may not be reproduced without my written permission. Links may be used, provided that full and clear credit is given to June Molloy Vladička and My Food Odyssey with appropriate and specific direction back to the original content. All views expressed on this website (excluding feedback comments) are my own, based on my own research and experience. Where I have endorsed a product (external website, book, restaurant, food product, wine, etc.) it is because I have reviewed the product personally and found the product to be worthy of endorsement. The views expressed represent my own honest &fair appraisal of the product, regardless of whether or not I have paid for the product. I do not accept payment of any kind to positively review or endorse products. This website is designed to be an interactive environment. I am very much interested in your feedback on the content of the website. Please use the “Comments” function to leave feedback on specific items. Constructive criticism, alternative options, content improvement suggestions or tips for other readers are all welcome. I will endeavour to read all comments and to reply where applicable. Please note that all comments are moderated. Comments which contain bad language or which are in any way abusive towards myself or other contributors to this website will be removed without notice. If you spot any inappropriate comments that I may have missed, please let me know. I reserve the right to reproduce, without notice, any feedback posted on this website. This website is about food discovery and as such I am always happy to try new food products and experiences. While I am sometimes in receipt of free samples of products for trial purposes, please note that acceptance or consumption of any such product does not constitute any contract to review or positively endorse the product on this website. While I may review or endorse the product within the website, I do so at my own discretion. Where I have received an item for free this will be indicated in any review or endorsement I might post. Any review or endorsement represents my own fair and honest appraisal of the product. I do not accept payment of any kind to positively review or endorse products. Submission of any products to me for consumption or trial is deemed to indicate acceptance of this policy. I am very grateful to my readers for their interest in and contribution to this website. By way of gratitude I occasionally run competitions for my readers. If you would like to sponsor a prize for a competition on this website, please contact me. Hi Don. Yes, that was us, on an episode of House Hunters International. The episode first aired in 2015 but I believe it has been shown many times since then. Hi June. 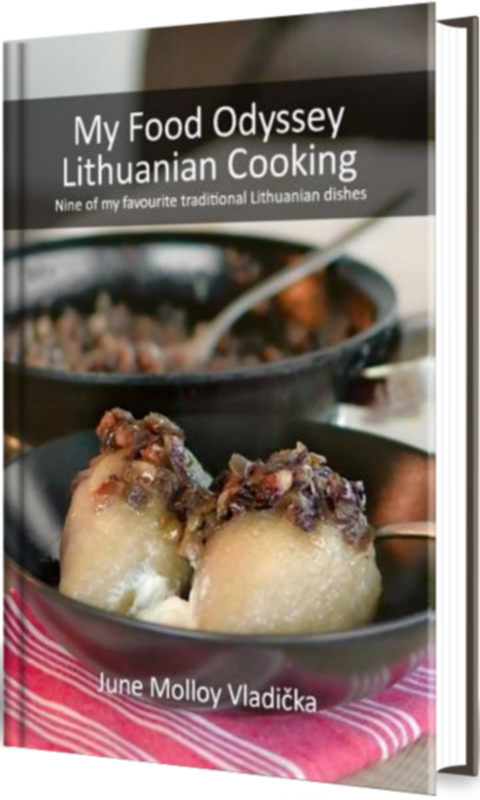 I am so thrilled to find your blog (which I happened upon by searching for a šaltibarščiai recipe). Thank you for that, and for the link to your House Hunters episode. I’ve often thought they needed to do an episode on Lithuania! I am not Lithuanian, but I served in the Peace Corps in Lithuania in 1999-2000. I have been back twice to visit, and my husband and I talk often about spending a year or so living there. We don’t want to relocate permanently, but I’d love to spend some time with my now 80 year old host mother who lives in Naujoji Akmene. Anyway, your blog is a great resource for us in thinking about this move. It’s always just kind of been fantasy talk – this makes it much more a reality. Thank you! Hi Sally! Thanks for your lovely message. Delighted you enjoyed the HHI episode and that the blog is giving you a nudge towards coming back to LT for a bit. You should – it’s fab! If you ever have any questions about living here just give me a shout. Take care, June. Hi there thanks for the follow. I want a van! Vans are the best! Borrow one from someone – loads of people in The Netherlands seem to have one! Hey certainly do. Weve talked about getting one. Thanks Eveline. Looking forward to reading future posts!